Irish Landscape Artist, Figure Painter, Portraitist. Biography, Paintings. The Irish landscape artist, figure painter and portraitist Nano Reid was born in Drogheda, County Louth in 1905. In 1920, she won a scholarship to study fine art painting and drawing at the Dublin Metropolitan School of Art - now the National College of Art and Design - under Harry Clarke. At the time, she was - in the words of fellow student Hilda Van Stockum - "a fierce redhead... uncompromising and looking for truth". In 1925 she started showing at the Royal Hibernian Academy (RHA), submitting a total of 42 canvases until the late 1960s. In 1928, she went to Paris and enrolled briefly at the Academie de la Grande Chaumiere, after which she spent a year in London studying fine art at the Central School of Arts and Crafts under Bernard Meninsky. She returned to Ireland in 1931 and once more began exhibiting her landscape painting at the RHA. More exhibitions followed: Engineer's Hall (1931) with artists Marion King and Olive Cunningham; a solo exhibition at St Stephen's Green Gallery (1934); a solo show at the Daniel Egan Gallery, Dublin (1936), which was repeated in Drogheda; the Water Colour Society of Ireland (1939). Reid was also involved in portrait art, having her works displayed at the Irish Drawings and Paintings Exhibition in New York (1938), and at the Dublin Painters Exhibition (1939) in Dublin. She continued to show her artworks throughout the 1940s, adding the Oireachtas, Dawson Gallery and Victor Waddington Galleries to her list of venues. During this time, Nano Reid also exhibited her paintings in London: at the Living Irish Art Exhibition at the Leicester Galleries (1946), St George's Gallery (1950), Hanover Gallery (1952). In 1950, with Nora McGuiness, Nano Reid represented Ireland at the Venice Biennale. This was followed by the Exhibition of Contemporary Irish Art in Aberystwyth (1953), and the Mostra Internazionale di Bianco e Nero in Lugano (1956), the Guggenheim International Award Exhibition in New York (1960) and the Twelve Irish Painters show in New York (1963). On the home front, Reid exhibited in Belfast and several times at the Dawson Gallery in Dublin. At the end of the 1960s she showed at the Hugh Lane Art Gallery. In 1972, she won the Douglas Hyde Gold Medal at the Oireachtas for the best history painting - Cave of the Firbolg. In 1974, the Arts Council and the Northern Ireland Arts Council staged a major retrospective of Nano Reid's artworks. She died in Drogheda in 1981. Retrospectives for Nano Reid were held at Taylor Galleries in Dublin (1984), Droichead Arts Centre in Drogheda (1991), and at Linenhall Arts Centre in Castlebar, County Mayo (1999). An individual, expressionistic artist, Nano Reid is acknowledged to be one of the finest Irish woman painters of twentieth-century visual art in Ireland. 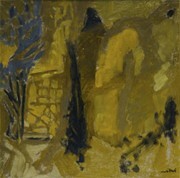 Her works are represented in many public collections throughout Ireland. The auction record for a work by Nano Reid was set in 2005, when her genre painting, entitled Card Players, was sold at Whytes, in Dublin, for €20,000.  For details of other twentieth century painters, see: Irish Artists: Paintings and Biographies.  For more about Co Louth artists like Nano Reid, see: Irish Art Guide.